Missionaries come from around the world to seek rest and restoration at Heartstream Resources in Liverpool, Pennsylvania. There Lois Dodds combines experience as a missionary with counseling and education as a psychologist to restore missionaries to service. 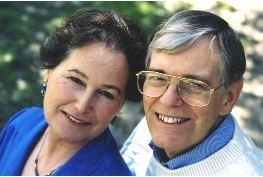 Until his death in 2008, her physician husband, Larry Dodds, assisted in spite of suffering from amyotrophic lateral sclerosis (Lou Gehrig's disease) and cancer. In 1983 the Dodds and their three children returned to their native California from the Peruvian jungle after 13 years as missionaries with Wycliffe Bible Translators (WBT) and the Summer Institute of Linguistics. Larry suffered burn out, a term just then appearing in medical literature. He had served as the only doctor for 250 missionaries plus natives for seven years. Help proved hard to find. A decade later, while teaching in the overseas extension program of Azusa Pacific University, they met other missionaries struggling with physical and cultural stresses and decided to offer help. One of 12 children, Lois learned to live by faith from a young age. Her mother once set the table, poured the water and prayed when their family had no food and her father, a merchant marine, was away. A knock on the door signaled someone had left groceries. At four, Lois was convicted of her sinfulness by a sermon and accepted Christ in a little country church. At 11, she dedicated her life to missionary work. Although she put aside college to care for her family after her mother suffered a stroke, later in life Lois earned a doctorate. Heartstream Resources is now a four-home residential facility: Lois owns two homes, colleagues own a third and a small house owned by Heartstream hosts office space. The décor of 14 guestrooms reflects Lois' gracious demeanor and the 30 foreign countries she has visited. Heartstream hosts groups of 12 to 14 missionaries about eight times a year for two-week sessions of intensive therapy that include spiritual care, counseling, classroom work and lots of time for reflection. According to Lois, missionaries may feel that no matter how hard they work, it is never enough. They love and want to serve God but feel inadequate. In their vulnerable condition, a health crisis may turn into a marital or emotional crisis. Heartstream offers multi-dimensional holistic care that includes medical, spiritual and emotional counseling. One Heartstream assistant called the ministry "the grace space," a safe place where others do not watch or criticize. Liverpool boasts of being the home of the first medical missionary to China, Elizabeth Reifsnyder. Like the wide, meandering river below, the legacy of missionary service flows on through Lois Dodds. Shirley Brosius is the author of Sisterhood of Faith: 365 Life-Changing Stories About Women Who Made a Difference. She is a member of Friends of the Heart, three women who share God's love through testimony, drama and song. Shirley also offers dramatic presentations of lengthy portions of scripture from memory. Her website is www.shirleybrosius.com.